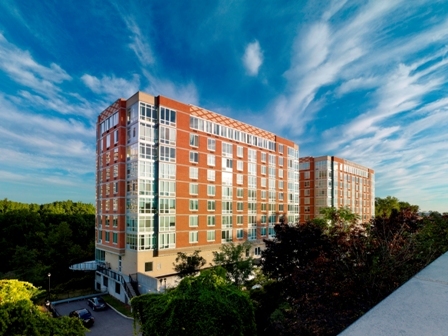 As one of the few new condominium offerings near or along Bergen County’s Hudson River waterfront, Trio has attracted homebuyers with an ideal urban lifestyle highlighted by luxurious and spacious homes, world-class recreational amenities, and its commuter-friendly location. Trio, located minutes from the George Washington Bridge in Bergen County’s sought after Palisades Park, features one-, two- and three-bedroom homes – including spectacular Penthouse residences — priced from $310,000. Homes are being offered with buyer incentives up to $30,000 in savings. Condominiums at Trio range in size from 742 square feet to 1,751 square feet and boast designer elements including floor-to-ceiling windows, hardwood floors and modern recessed lighting. Gourmet kitchens include granite countertops, stainless steel GE appliances, custom maple cabinets, and Kohler fixtures. Designer bathrooms boast Crema Marfil marble floors, granite countertops, custom maple vanities, and Kohler fixtures. All homes come with an individual washer and dryer. Immediate occupancy is available. Trio’s exciting suite of newly-renovated, five-star recreational amenities creates a living environment that rivals some of Manhattan’s most exclusive buildings. Trio’s residents enjoy concierge service, a lounge featuring billiards, ping pong and large screen TV with catering kitchen; state-of-the-art fitness center, yoga studio, children’s playroom, game room, virtual golf simulator, outdoor terrace and a business center all located within the buildings. Covered parking is also available.